If the person on your left isn’t connected to at least one social media outlet, it is very likely that the person on your right is. The beauty of social media is that it easily connects us with our family and friends from around the world. But have you ever thought about the social media effects on marriage? The ugly part, however, is that it can disconnect us from the ones nearest in proximity. It can be considered a weapon of mass destruction for your marriage if you’re not careful. Read on to discover a few red flags that indicate that it is just that! If you notice that what starts as an innocent scroll down your timeline, quickly turns into the urge to compare, copy, and then compete…you’ve got a problem, my friend. If you’re suddenly nitpicking and nagging your spouse after logging into social media; viewing content that might not even be true, it’s time to re-assess what’s really going on. Because a vast majority of social media posters tend to highlight only the positive aspects of their life, it can leave some feeling like they need to measure up. However, placing unrealistic expectations on your spouse to run in a rat race with your followers and social media friends is not the answer. Doing this creates an unnecessary strain on your marriage. What were you grateful for before you noticed that Maria and Joe went out Friday night, as you sat on the sofa eating a bowl of cereal? Keep things in perspective! And honestly, if you can’t handle the heat, save your marriage and get out of the (social media) kitchen. Better to live alone than with a nagging spouse, and ridiculous to do so as a result of social media related antics! Oh, how we love the “likes” and the “retweets”, and the “shares” and the compliments! There’s nothing wrong with a little encouragement every now and then, but it definitely becomes an issue when we feed off of it and find ourselves thirsting and disappointed when it is lacking. If another person’s filtered selfie is causing you to get down on yourself, it’s time for a change. If you’re posting for others to validate you, then you’ve likely got pre-existing self-esteem issues that were lingering prior to marriage and social media accounts. Believe me, social media is only a contributing factor. And tell me, who is likely to pick you up when you are down? Your spouse! A spouse is a great support, but it’s not their job to validate you, either. The excessive pressure to be your wonderful counselor can become too much to handle in your marriage. Keep an eye out for this sign. Strive to get off of the emotional coaster and heal if necessary. If you melt because of their acceptance, you will certainly fall because of their rejection. Giving away that much power can be detrimental. Let your validation come from within. Social media can be a great place to connect with family, friends and co-workers. However, it can also be a gateway to an affair. If you or your spouse is setting up secret social media accounts or deleting private messages, there’s an issue! If you can’t share it with your spouse, then you shouldn’t be doing it! 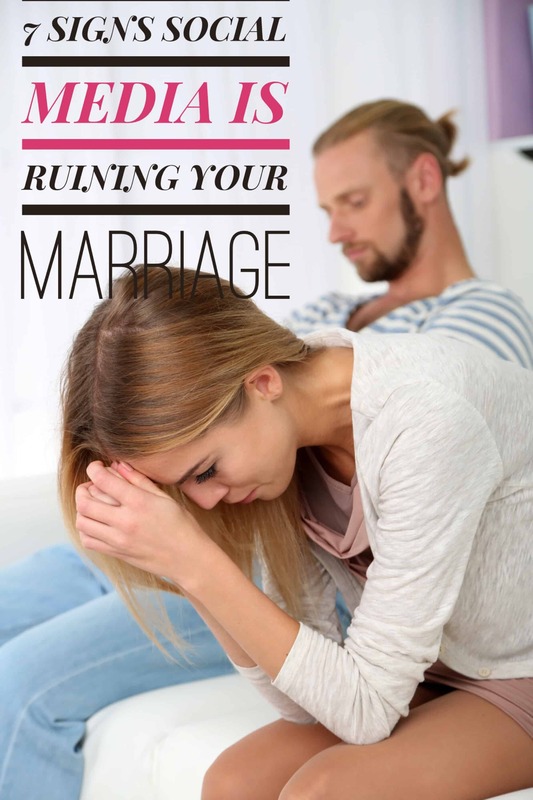 Don’t forget to sign up for my FREE marriage email course! It’s Saturday morning. You’ve got a kink in your neck and a hangover – like literally, your head is hanging over and you haven’t lifted it in minutes. You can’t quite remember everything that happened the night before, because like then, you’re distracted. Your spouse is talking and you just realized, shoot…it’s your turn to respond. Your opposable thumb was at it again and you’ve been caught mid-scroll. All you can do is say “uh huh” and pretend you were listening, or lift your head in shame, acknowledging that you missed it…again. You open your social media apps consistently and unconsciously, and you interact with that community more than you do the one in your reality. Need I say more? If this is happening often, it’s a clear sign that requires your attention so that it doesn’t ruin your marriage. Communication is key for a thriving marriage, and listening is such a huge component of that piece. You can’t fake it ‘til you make it with this one, guys. Remember the days you couldn’t take your eyes off of your spouse? Break bad habits and divert your attention back to them and watch things turn around. Is your communication with your spouse lacking? Grab our 5 quick communication tips! I’m a strong believer that discretion is your marriage’s greatest protection. And let’s face it, even with a private account and special settings, it’s the worldwide web people! You can’t get more global than global. Not every one of your social media friends and followers can be trusted on the same level. Not all offer the same support and well wishes. Now don’t go paranoid trying to figure out who your haters and frenemies are, just use wisdom and safeguard what is precious like you would do anything else. If you’re disclosing too much private information about your marriage in this public world, you’re inviting too many people into an intimate space that was intended to be shared solely between you and your spouse. Unless you guys are in agreement, one of you is leaving a dangerous door wide open for pests to enter into your garden of love, and it can certainly lead to the demise of your marriage. Whether or not you’re really looking at posts of interest, or spending majority of your time in social media scrolling, hoping to stumble upon something interesting…tick tock goes the clock. You can’t get the time that you spend back, so it’s important to make sure it’s worth your while. Not to mention, too much screen time isn’t healthy on your eyes either. Those precious minutes of unproductivity could be spent cultivating your relationship. Explore your options to make your marriage healthier. Maybe deactivating your social media account is not the best decision for you, but taking a hiatus could help you re-focus on what matters most. If you’re already getting complaints from your spouse about your usage, then scheduling your “play time” or creating more appropriate boundaries may be a pretty good idea. Who knows, you may even discover life is better without it. No sense in letting your marriage deteriorate; rest your thumbs, rekindle some flames, and hug your honey…they’re worth the investment. These days social media outlets are using ads something heavy. Not just any ol’ ad either, but strategic ads. They’re posting based on your search history, and they know just what you like! Many of these ads send subliminal (or obvious) messages of all the things you “need” that can put a strain on your wallet…if purchased. In a marriage, one spouse is typically a spendthrift while the other is a frugal penny pincher. The number one argumentative issue in a marriage is money, and social media can be a subtle culprit for the spender if not cautious. The ads make it easy for a person to purchase items or come up with new (and sometimes costly) social media influenced ideas. I perceive it to be difficult for the penny-pinching spouse to get on board with those. Way to heat up an argument! Let’s be real, even when it’s on sale and there’s free shipping, you save 100% by not spending at all. 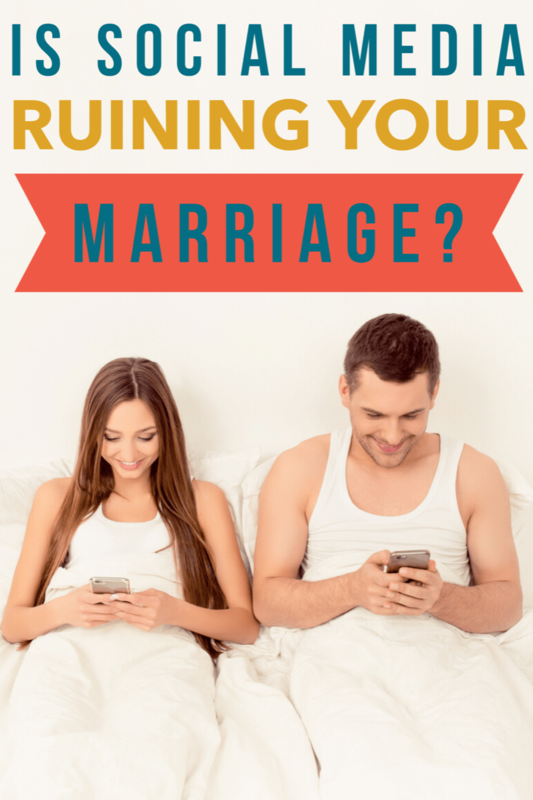 Close the app, and save yourself an argument that can potentially save your marriage!